Dental bonding, also known as composite or tooth bonding, is an excellent way to fix cosmetic and structural imperfections in the teeth. Dental bonding can repair cracked, chipped, and discolored teeth as well as replace silver amalgam fillings. 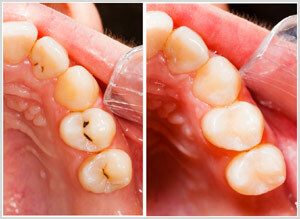 Cosmetic bonding can also repair misaligned teeth, providing a straighter, more uniform smile. Bonding offers several benefits for patients. Bonding can usually be completed in one office visit, depending on the extent of repair needed. It is quick, affordable and relatively painless. Dental bonding is also a great alternative to more extensive/invasive cosmetic dentistry treatment with porcelain veneers, fixed bridges, and crowns. Additionally, the composite resin used in a cosmetic bonding procedure is very flexible, expanding and contracting with the natural tooth to prevent cracks and tooth loss. Dental bonding is an excellent option for individuals looking to repair minor imperfections in their smile.